Tato kniha vypráví příběh založený na VW karavanu s 60, 70 a 80 let. Nejen že je tam mnoho RV modelů různých značek, ale také vám může pomoci s nápady jak si sami zdokonalit vašeho mazlíčka. Zde jistě najdete jedno překvapení za druhým z množstvím vyrobených verzí na 176 stránkách. Volkswagen Camper 40 years of freedom, Volkswagen vans come in many varieties, the campers are by far the most popular. We use the term Volkswagen Volkswagen Camper but she has never built it were separate companies that brought the campers on the market. They used the standard dense vans, buses with windows, buses intended for passenger and even pick up models which serve as a basis for conversion to camper. 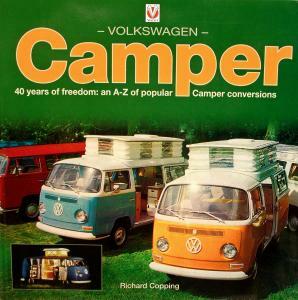 This book presents the story of based on Volkswagen camper with the 60 70 and 80 are central. Not only are there many RV models discussed from different brands but the book can also help you with ideas to do it yourself to go through the multitude of clear full color images. You will discover one surprise after another as you the multiple looks of versions, options and opportunities available through the years have been. 176 pages.